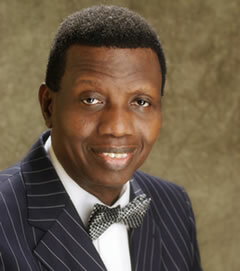 Here, in this mail, is the text transcript of the message by our Father in the Lord, Pastor E. A.Adeboye, on Friday of the Convention - The All Sufficient God. 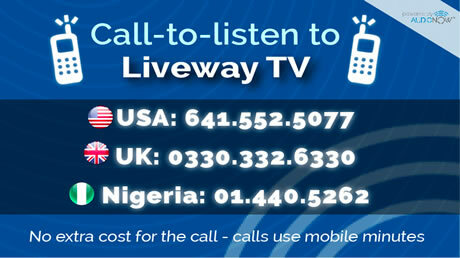 Many thanks to you for your prayers and support ofLiveway Radio. Our community FM on 107.9 was very active during the Convention, we were able to relate traffic information, announcements, up-to-the minute coverage from all our providers and Team Nehemiah. Call: 0708-442-8216 for how you can place your valuable products and services in from of our teaming listeners and viewers during this Convention. Lift your voice to Him and say, Father, don't let me go away empty handed tonight. Go ahead talk to the Almighty. Don't let me go away empty handed tonight. Please my Father and my God, don't let me go away empty handed, don't let me go away empty handed, please Lord let me meet with You tonight, don't let me go away empty handed, don't let me go away empty handed. Daddy says there is someone here tonight, your cry is that 'God will remember you'. Daddy asks me to tell you, I will remember you tonight. King of kings and Lord of lords, Lord of host, the Lord strong and mighty , Lord mighty in battle we worship You, accept our worship in Jesus' Name. Shake hands with one or two people, and prophesy to them that 'God will remember you tonight'. If you have opened your Bible let me hear you say 'amen'. If you have not opened your own say 'wait for me'. "And when Abraham was ninety years old and nine the Lord appeared to Abraham and said unto him, I am the Almighty God; walk before Me and be thou perfect". God said to Abraham, He said I Am Jehovah El - shaddai, the God who is more than enough, the All Sufficient God. That is while the Bible says 'the just shall live by faith'. Jeremiah 32 verse 27, says "He is the God of all flesh and there is nothing too hard for Him". There was this young man, a teenager, and he has a blood condition that is called "ss", had been sick all the days of his life. He said, "I had that Daddy G.O. is coming to this church this next coming Sunday". I want to testify, that, "I will be healed on that Sunday". Somebody phone me to tell - "this young man gave this testimony". He came to me and say Daddy, 'I have been sick all the days of my life, but I am confident that since you have come to this church today, I will be healed today'. He wrote, "Dear Daddy, I want to thank God and I want to thank You, I have been healed since the day you came to our church". Psalm 24 verse 1. The Bible says "the whole earth is the Lord and the fullness thereof". I said don't worry, God will provide for you, etcetera; you can go home now. She said I cannot go because I don't have the money to travel back. Psalm 16 verse 11, the Bible says "in His presence there is fullness of joy". I almost told Him 'Lord, I am praying'. So, I opened my eyes and He pointed at a woman in the crowd, who was drenched in tears; God said, go and tell her to 'weep not'. Sister! God said, 'weep not'. She opened her mouth and closed it. She couldn't say anything. She opened her mouth the third time and said "Jesus! Jesus!! Jesus!!!" She said, I was the woman who was weeping that you came to and said "weep not". She said, "I had been barren, I think twelve years, and the relatives of my husband said I should get out of the house if I don't have a child. That is while I was weeping that day". In Psalm 75 verse 6 to 7, the Bible says promotion comes not from the East or from the West, it doesn't come from the South, promotions come from God. And then, in 1Samuel chapter 2 verse 7 to 8, the Bible says 'God can pick up a beggar form the dunghill, and set him among princes'. I can give you testimonies, but don't let us waist time because will have a lot of prayer to do. I am believing God for someone here tonight, someone who never thinks he or she could be a vessel unto honour in God's hands, before you die, the world will know you with Christ. Ok. He asks me to tell you a story, so that I won't have to tell you, you will be able to put two and two together. And he came to the Holy Ghost Service, and God spoke through me and said, that there is someone here, someone close to you is going to die, He said don't be sorry at all. If you didn't do so, in your own interest, before you leave here tonight, surrender your life to Jesus. I was reading my Bible, in the book of Revelation, and again and again and again, I keep reading about the seven Spirits of God - seven Spirits of God. I want to encourage you, don't be lazy tonight, because you are going to pray seven serious prayers. Don't be afraid. I told you yesterday 'don't be afraid'. And if you are seating where you can't see, you are free to come and stand where you can see. Or they will help us show it on the screen. Move the camera back, so you can see this thing accurately. I urge those of you in front - capture the whole flag. Please. So, before we begin to ask for big things, first five minute, just thank God.And that should be easy for you to do. But do it with all you heart - With all your heart. Now those of you who are very old, who can't stand, you can sit down no problem. The All Sufficient God can not only heal, He can make whole, but He can go a step further - He can give you the gift of healing. That is flag number two. It is done in Jesus' mighty name. God says 'if you do mine, I will do yours'. I know I won't beg you to pray this one. I know you will pray this one. Lift your voice to the Almighty God, and say, Father, if you need only three divine treasurers, let me be one - let me be one of them. The Master said, 'those who are with us are more than those who are with them'. He asked God to open the boy's eye, and he saw them surrounded by horses and chariot of fire. Please lift your voice to the Almighty God and say,Father, from this moment onward, surround me and my family with horses and chariots of fire. The Bible says, "the end of a thing is better that the beginning thereof"
Do you know you can go heaven, you don't have to be sick, you don't have to have pain, you can go the way I will go when my time is come. And say, Father, let me end well for the rest of my life, no more sickness, no more pain, no more sorrow, no more suffering - let me end well. In Jesus" mighty name we have prayed. Go ahead talk to God for about seven minutes on three major things - big things. I am sure some of you will still be wandering why we are still here in this auditorium - I mean if you look to your right to your left, look everywhere, you know we have to thank God that He didn't rain. We would have been in serious trouble. For the first time in my life, I have become almost a beggar - begging for money. I don't know about you, this has been a very special night in life.